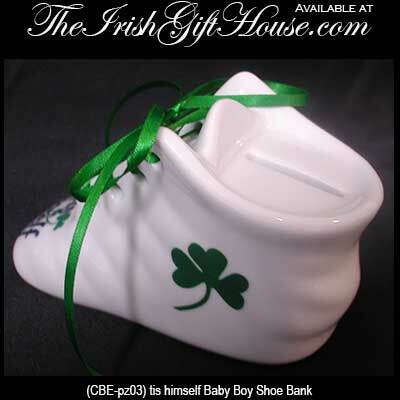 Irish money bank features a 'tis himself baby shoe that is enhanced with green shamrocks along with green laces. The 'tis himself Irish baby shoe bank would make an ideal child's gift. 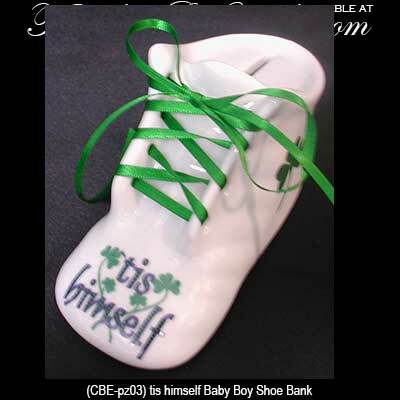 This Irish baby shoe bank features the words 'tis himself along with green shamrocks and shoe laces. The porcelain shamrock bank measures 5" long x 2 1/4" wide x 2 3/4" tall and features a bottom rubber stopper.